Not only does this weightless, alcohol-free setting spray lock in make up for up to 24 hours of wear, it also provides impressive pollution protection, guarding your delicate complexion from the harmful effects of airborne pollutants. With conditioning algae extract and an excess oil-absorbing polymer, the quick-drying formula gives a natural, nourishing finish, keeping your make up handiwork in place without feeling sticky, greasy or drying. 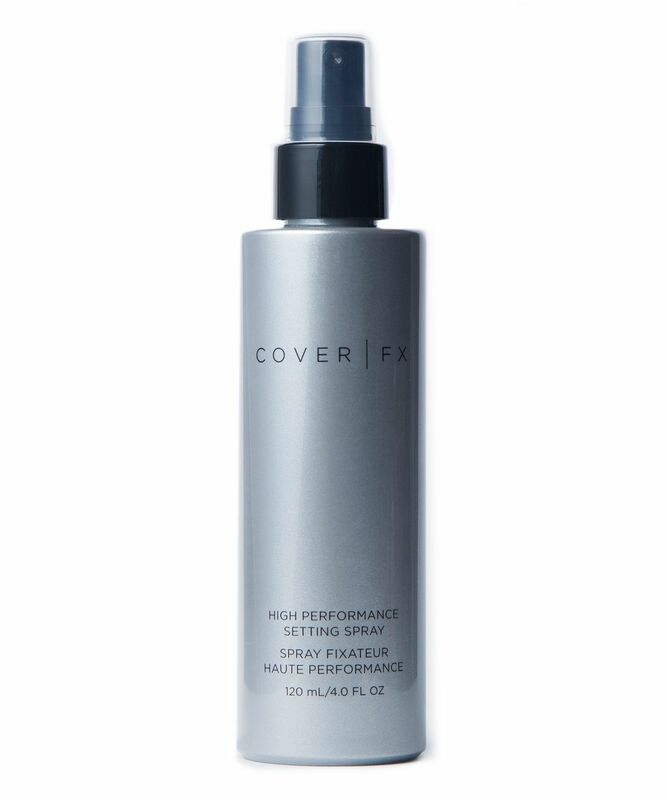 Set your make up the smart way with Cover FX’s weightless, alcohol-free High Performance Setting Spray, which locks make up in for up to 24 hours of flawless wear – while also conditioning the skin and providing protection from pollution. Ensuring that your make up won’t fade, settle or crack, this quick-drying formula works on all skin types, providing a natural-looking finish while keeping your base and colour products perfectly in place without feeling sticky, greasy or drying. Cruelty-free and vegan, the spray stars conditioning algae extract (which helps to fend off those damaging free radicals and airborne pollutants) as well as a clever polymer that absorbs excess oil to balance your complexion. Shake very well before use. After makeup application, hold bottle 8-10" away from the face and mist evenly onto the skin. Close eyes and mouth while applying. Keep out of eyes. Pro-Tip: Want even longer wear from your foundation and concealer? Wet your brush or sponge with High Performance Setting Spray before you apply! Water (Aqua)(Eau), Pvp, Butylene Glycol, Acrylates Copolymer, Ppg-3 Benzyl Ether Myristate, Phenoxyethanol, Ethylhexylglycerin, Peg-8 Dimethicone, Caprylyl Glycol, Poloxamer 407, Alteromonas Ferment Extract, Methyl Methacrylates Crosspolymer, Citric Acid, Sodium Hydroxide. Lives up to it's name. I put on a full face of makeup and then set it with the Pressed Setting Translucent Powder and the COVER FX High-Performance Setting Spray before heading out on a weeknight date. I didn't find this drying or that it made the makeup crack. Also, it didn't dry and leave a sheen on my skin as I find with the Urban Decay All Nighter spray. Will definitely purchase again. I travel a lot and I often need to put makeup on at 4 am, get on a flight or train and not be home until 9, 10 pm. It’s hard work for makeup to last this long, but I cannot carry too much makeup as have to keep things to a minimum. Well, this setting spray is the answer to my prayers! Even on a humid day recently, my make up stayed on like never before. I also went to a dinner and gala ball where I danced all night and my eyeliner and wing did not budge. I was delighted not to end up with panda eyes. It is not as nicely scented as some others I have, but that’s worth it as it really delivers. I’m delighted with it and will be re-purchasing. Highly recommend and worth every penny. Too drying and make my makeup crack. I can't believe it. First of all, I have combination skin and it's winter. The nozzle is a bit off, there is very little mist coming out and you can feel there is layer of powder on your face making your skin super dry and tight. I'm into natural and dewy make up and this just make my skin super matte. The concealer on my eye areas and foundation on my cheeks start to crack within 2 hours. It's not as nourishing as it claims. Very disappointed as I pay a lot for this.